As the CEO or CFO of a financial organisation, the final say on modernisation may be yours. But do you want to risk putting your wealth management and financial accounting operations at the mercy of an ERP migration process that entails so many risks? The lack of migration experience of your task team. Do you have an in-house IT team or have you entrusted the migration to a group of employees? The chances are that even your IT specialists and network manager have only undertaken a migration on a few occasions. Costs. Whether your modernisation requires an upgrade of your hardware infrastructure or merely the acquisition of new software licences, migration from legacy comes at a price. Disruption of operations. Even a faultless data migration and ERP update will require your employees to test the accuracy of data post-migration, and to adjust to a new user interface. Should your testing reveal inaccuracies, you could be required to halt operations until the errors have been resolved. Falling so far behind the current technology that your entire hardware infrastructure will need an overhaul when you eventually modernise, resulting in a major blow to your budget all at once. Legacy hardware and software systems tend to be less resilient to breaks. Potential data loss and repair costs will also be much greater, especially if your system is no longer supported. Outdated software and hardware present a higher risk of security breach. Both the disruption of operations and the cost of a security breach will end up costing your business more than if you had modernised your system in a timely fashion. Data incompatibility. Over time, data in outdated applications can become incompatible with new software, particularly when the data is stored in proprietary databases or other legacy data storage systems. Once you eventually complete your software migration, it will prove to be more complicated and expensive to undertake a data conversion. Inefficient Business Operations. Legacy systems are more rigid and tend to limit you in terms of functionality. Old financial and wealth management applications lack ease of use, ease of access (remote access through your own device), and flexible, real-time tracking and reporting. 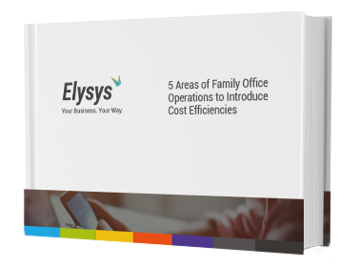 Are you ready to explore the possibilities of Cloud based software for your family office? Download our free ebook now to assist you in finding the Cloud solution that suits your business needs best. When weighing up the risks and challenges of migrating from legacy with those of staying put, it’s not hard to see why modernisation is inevitable. And also, why its better to migrate sooner than putting it off. While a systems overhaul is inevitable if you are still operating on a legacy system, by doing it right you can ensure that you only have to go through it once. The best way to get your systems modernisation right the first time is by opting for a Cloud ERP system. The last data conversion you’ll ever do: When migrating to a Cloud ERP such as the Microsoft Dynamics platform, your data is converted to an industry standard format before it is stored on the database. By ensuring that your data is compatible with standard software right from the start, future software upgrades or switches will not require additional data conversion. Always up to date and state-of-the-art: By opting for a SaaS package that includes regular software upgrades, your provider takes the responsibility for keeping your applications up to date. Additionally, hosting your software and data in the Cloud means that your Cloud host takes the responsibility for backing up your data as well as the maintenance and upgrade of infrastructure that underpin your solution. Incremental adjustments, improved operations: By implementing regular software upgrades users are never faced with enormous adjustments to an entirely new interface. Implementing incremental changes reduces disruption to your operations and improves the likelihood that employees will explore and adopt improved features right away. Intuitive and User-friendly: Have you ever struggled to onboard a new staff member onto your legacy system? Cloud-based wealth management applications are designed based on intuitive and familiar user interface models. This means that anyone who is familiar with applications such as online banking and Microsoft Office 365 will find adjustment to Cloud applications a breeze. Modernising your family office software might seem an insurmountable challenge if you are operating on a legacy system. Migration is always risky and costly. And yet, by moving your operations to a Cloud-based ERP, you can prevent yourself from ending up in a similar dilemma a couple of years down the line.